I’ve had to deny being the author of this ad many times even though it’s not even my style. I didn’t write this, truly—but I wish I had. Whoever wrote it, it says what a lot of other people are thinking. On the topic of anonymity, it’s funny how much time Vancouverites spend wondering who wrote what. Vancouver, HQ of anonymous investors and anonymous commenters talking about being forced to live inside the real estate scam of the century. @Goldiein604 @evelazarus @ounodesign No idea but any engaged resident could have done so. Very well said & felt by many. 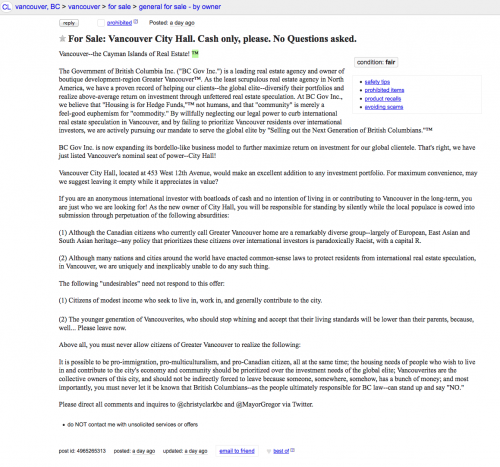 For Sale: Vancouver City Hall. Cash only, please. No Questions asked. BC Gov Inc. is now expanding its bordello-like business model to further maximize return on investment for our global clientele. That’s right, we have just listed Vancouver’s nominal seat of power–City Hall! Vancouver City Hall, located at 453 West 12th Avenue, would make an excellent addition to any investment portfolio. For maximum convenience, may we suggest leaving it empty while it appreciates in value? (1) Although the Canadian citizens who currently call Greater Vancouver home are a remarkably diverse group–largely of European, East Asian and South Asian heritage–any policy that prioritizes these citizens over international investors is paradoxically Racist, with a capital R.
(2) Although many nations and cities around the world have enacted common-sense laws to protect residents from international real estate speculation, in Vancouver, we are uniquely and inexplicably unable to do any such thing. (1) Citizens of modest income who seek to live in, work in, and generally contribute to the city. (2) The younger generation of Vancouverites, who should stop whining and accept that their living standards will be lower than their parents, because, well… Please leave now. Please direct all comments and inquires to @christyclarkbc and @MayorGregor via Twitter. This entry was posted on Monday, April 6th, 2015 at 5:37 pm	and is filed under humour, politics, urban planning, Vancouver. You can follow any responses to this entry through the RSS 2.0 feed. You can leave a response, or trackback from your own site.